This menu is a day late, but it’s Labor Day weekend and therefore not your typical week, so I’m counting today as Sunday. I’m proud to say that I stuck last week’s weekly menu, and it really made my life easier. I spent way less time at the grocery store, and I seriously think I gained an extra hour each day because I was not looking through cookbooks, blogs or magazines fretting about what to cook for dinner. I honestly suggest to you all to get a weekly menu in place, as it will make your life easier. This is the week where all my kids’ activities begin to ramp up, so goodbye to ease and relaxation, and hello craziness. 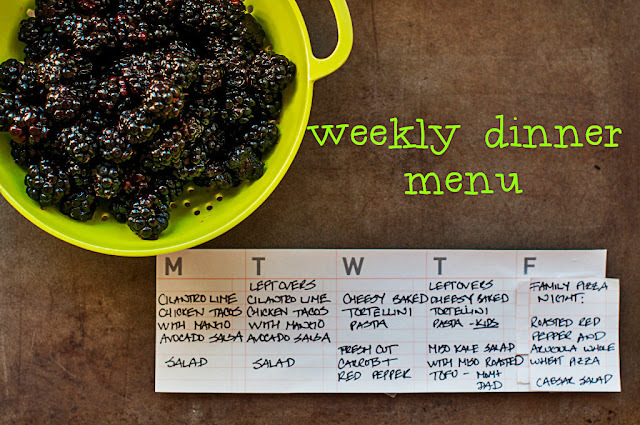 This week’s menu is pretty boring, as were having a bunch of two-night meals. I need to get in the groove of the new schedule and these meals below are all make-ahead meals, and ones I don’t have to fuss with. Thursday is going to be my crazy night till November. I may even omit cooking for this day, as both kids have activities back to back, and they are both going to be eating dinner at two different times. Major chaos. I will attempt to have something easy that I can either heat up quickly for them, or I may just make it a sandwich or burrito night. 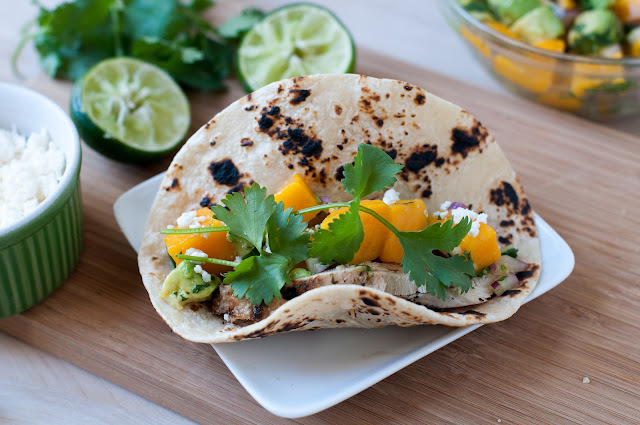 Monday: Cilantro lime chicken tacos with mango avocado salsa and mixed green salad. This is an easy two-nighter dinner for us, and mangos are so good right now. Tuesday: Leftovers – Cilantro lime chicken tacos and mixed green salad. Wednesday: Cheesy baked tortellini pasta and fresh cut carrots and red pepper. I’m using Dave’s gourmet pasta sauce here, not homemade marina this week, as sometimes you have to cut the corners when life gets busy. Thursday: The kids are having leftovers of the tortellini pasta and fresh cut carrots and red pepper. 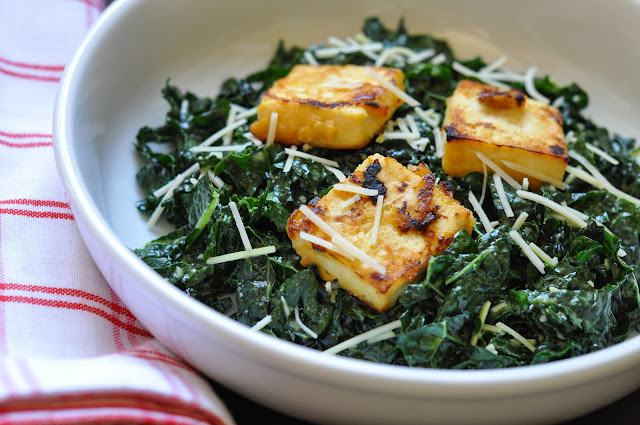 Thursday: John and I are having miso kale salad with miso roasted tofu and whole wheat naan bread. 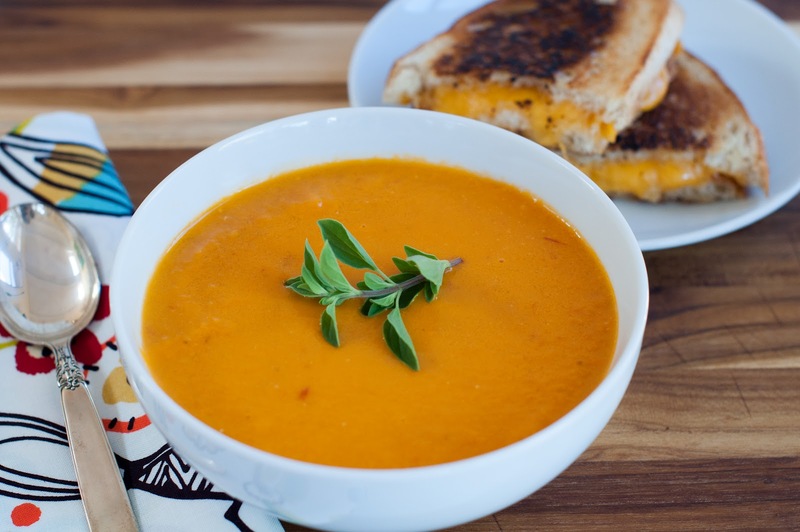 Stay tuned for Wednesday, as I have an amazing heirloom tomato soup to share with you. Your family is so lucky having all these good food for your dinners. 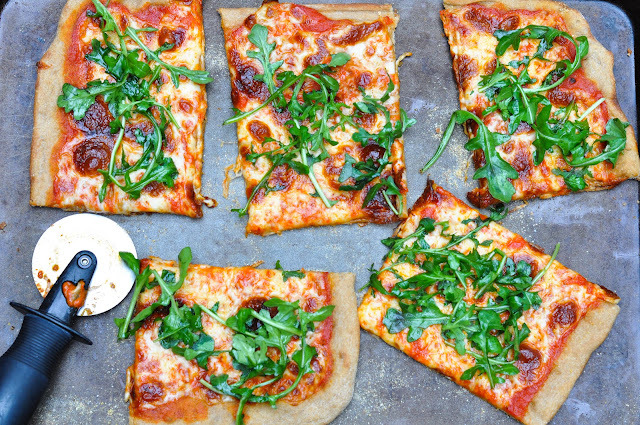 Everything looks so amazingly delicious. can i come to your house this week for dinner! It all looks amazing. These are great meals – you have one lucky family. I always seem to wing it! or I start off with menu and change my mind. YOur photos are gorgeous! Hi Mary! I often do the same thing and change my mind at the last minute. I am trying to get better organized this fall and planning my menu in advance has really helped me. Thanks for the sweet compliment regarding the photos. Its fun playing around with the camera when I have time. I love the way you put together your weekly menues…very unique and with GREAT recipes! I’m sharing the Very Inspiring Blogger Award with you! (http://roastedrootfood.com/2012/9/2/seasons-summer-flowers-a-nomination) I love that you’re an empowered mom with a great knack for cooking healthful meals and I always enjoy reading your posts! Hi Julia! Thanks for the sweet compliment and for sharing the blogger award with me! You rock!